long a road walk! After a breakfast if eggs and waffles we called Suzanne. She was sorry. Her husband needed the jeep. Long story short, 2 hours later we were finally back on the trail. It was a hot, yet lovely walk up. A slight breeze made what could have been a sweat invoked walk quite pleasant! The trail wound it’s way over and around providing spectacular views , skies varying shades of blues and purples. 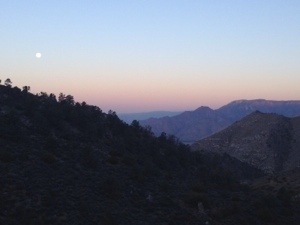 The beginnings of the Sierras arising in the distance. Expansive views in all directions. Towards the end of the day it was necessary to find water. The only source available was a spring in which it was deemed unsafe for human consumption due to high levels of uranium. We were told however one liter or two wouldn’t hurt us, and we were completely out of water. The water situation has really opened my eyes to the water shortage in other parts of the world. I have always taken weather for granted. But, the whole of the first part of this hike has been planned around water availability. I have been very thirsty. I believe I have been dehydrated. But as I was about to say, on numerous occasions ,” I am dying of thirst.” I had to stop . I was not dying of thirst , but others in the world are . It was an intense realization. After a beautiful night under the stars we began early. Watching the sun rise and the mountains wake up is truly one if my greatest pleasures . The wide expanse of the mountains once again reminded me if the great potential we have in this life. We never need to feel stuck. The next bend in the trail will bring something new , something to make our lives worthwhile . The mountains and the oceans are great teachers of this lesson. We met an older couple on the trail. Their trail names are Two Bad Dogs. They were from Colorado. They hiked last year but she was injured so they came back to finish their unfinished section. They were passionate about the trail . They were passionate about each other. They gave me hope. I have shared with you in past posts about the black crow and how I feel they are significant somehow in my life. They have showed up daily . I especially love it when I hear them, usually two, sometimes one, I look into the sky and they grace the above with their beautiful glide and dance. Well lately , and daily a white butterfly has appeared . She circles me on the trail. I smile. She flutters away . Black crow, white butterfly , I ponder the meaning . My body has prohibited me from a good night sleep, every night. Yet , each morning I arise, ready to walk again. I give thanks. The short , yet significant walk into Kennedy Meadows, was momentous . It was the 700 mile mark, and, the entry into the Sierras. We left the next morning as we heard a storm was brewing over Mt Whitney. We wanted to get into Lone Pine and wait it out. 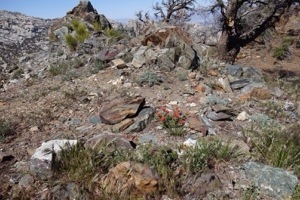 The trail truly marked our entry into the Sierras. We followed the Kern River. 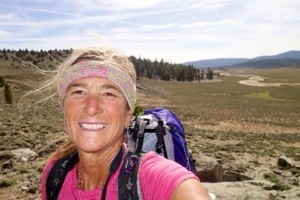 As I walked , solo as usual my mind alternating between bring in the moment and listening to the teachings of the trail and applying them to my life. Today walking through a burn area from 2008 a sadness fell over me. 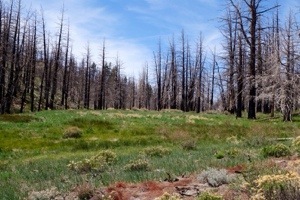 This forest ,unlike others that had burned, didn’t have much new growth.it was stifling hot. I saw death . I looked ahead and a bright blue sky beckoned me. I walked faster. The need to exit the clutches of this burn propelled me forward. It was devastating . In my attempts at embracing the concept if impermeanance , I realize the real difficulty is the acceptance that some things simply do not return as they were. New things replace those that are gone, and that us beautiful . But some things are just gone. 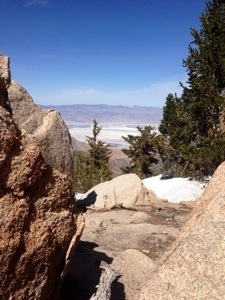 Hiking towards Lone Pine the past couple of days was tough for me. I bonked. Big time . I didn’t have the energy I needed to walk up the mountain. I realized I wasn’t consuming enough calories . It was tough to even lift a leg . We had two over 10,000 foot passes , about 5000 feet in elevation . It shouldn’t have consumed all my energy . It did . The last pass as I crossed over, I broke down into years . 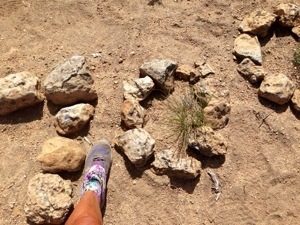 I remembered the JMT, last year . 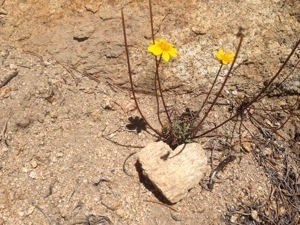 I was hiking with a lovely man named Tom. Every pass, I would cry . He would gently ask why . I had no explanation, as there was no thought associated with the tears . Today, however a thought occurred to me. Perhaps the tears are for all those who don’t push themselves . For those who don’t attempt a summit. For those who were never given the chance . For those who never realized they could. Life is so rich. The possibilities are endless . Don’t let your story consume you. Start a new chapter . Summit. Rise above. I miss you Laura. Walk on, with love. Let the tears fall on the mountain passes. Passes, passages. I know why now. I just love your soul and your words! Thank You Laura for the beautiful perspective! It touches my heart. They do really great work, and they are probably one of the most well known advocates of access to clean water as a basic human right. Great writing mom, I’m so incredibly proud of you and it is so exciting when your experiences in real life lend themselves to important causes that you want to promote. I love you so much and I’m so lucky to call you Mama.